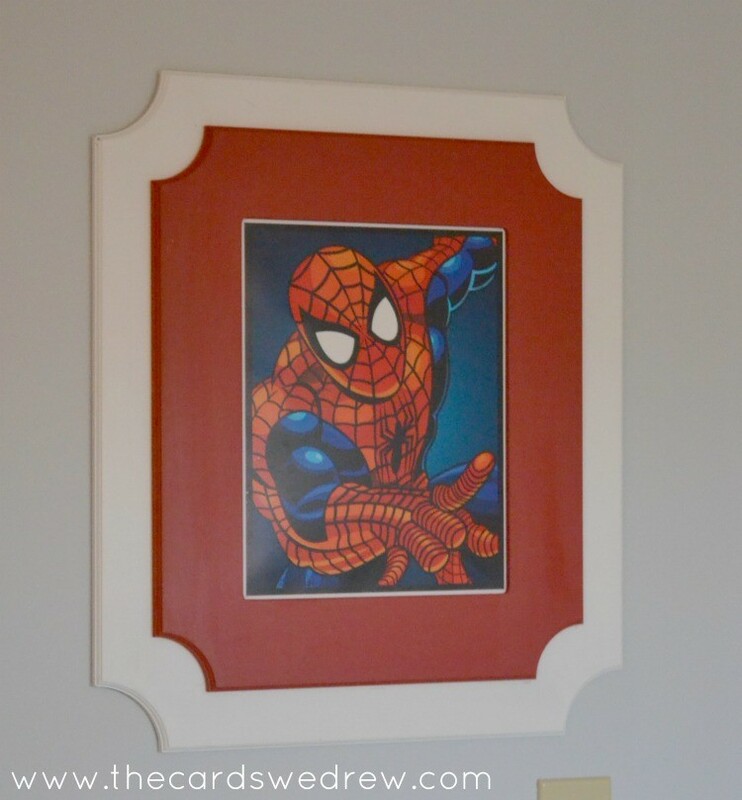 Framed Super Hero Prints + Giveaway! Hope you all had a wonderful holiday, I took a little blogging hiatus and it felt so nice to just unwind and unplug for the last week! But now I’m back at it and I’m excited to share with you the final part of my son’s room reveal! 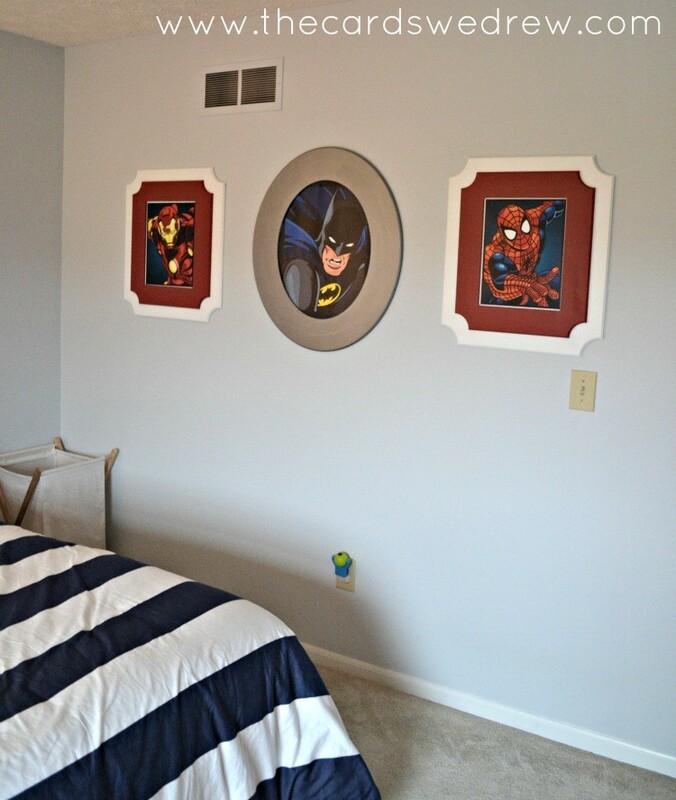 You may or may not have seen other parts of the reveal, but this is the final part…the Framed Super Hero Prints I made to add some of his character to his room. I worked with Cut It Out Frames, Modern Masters Metallic Paints, and Box of Oddities for their superhero prints. 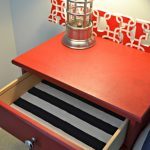 I also want to show you one other post after this how I used fabrics to customize his bedroom shade and add some more pops of colors to the room. 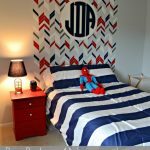 But TODAY I’m sharing how I tied in some fun Superhero bedroom prints that would accent my son’s tastes, but without being over the top superhero throughout the room. It all started when I found these great superhero and comic book prints from Box of Oddities on Etsy. Each print was so unique and not over the top and my son LOVES each of these characters…Batman, Spiderman, and Iron Man. So I contacted her and ordered three prints for his room. I specifically wanted to find prints that coordinated with the colors already used in the room (silver, blue, white, and red). From there, I started looking through Cut It Out’s website for frames I could use. Cut It Out sells unfinished wood frames in a wide variety of shapes and sizes…all very unique and fun for gallery walls and other framing ventures. I picked out two double layer frames (Parker 11×14 Double Layer Frames) and one single layer frame (Oval 16×20 Single Layer Frame). 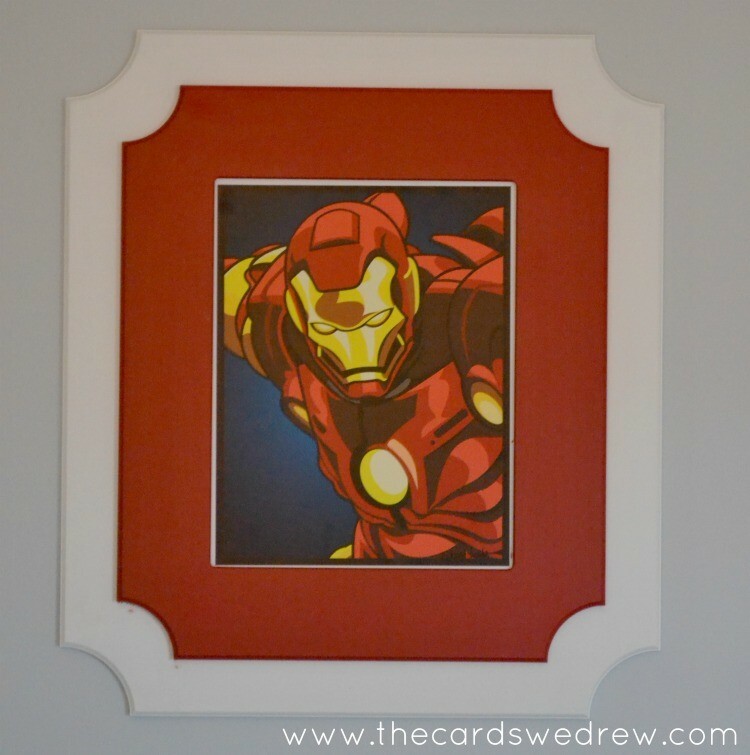 I used the double layer frames for Spiderman and Iron Man…painting the bottom layer white and the top layer red. 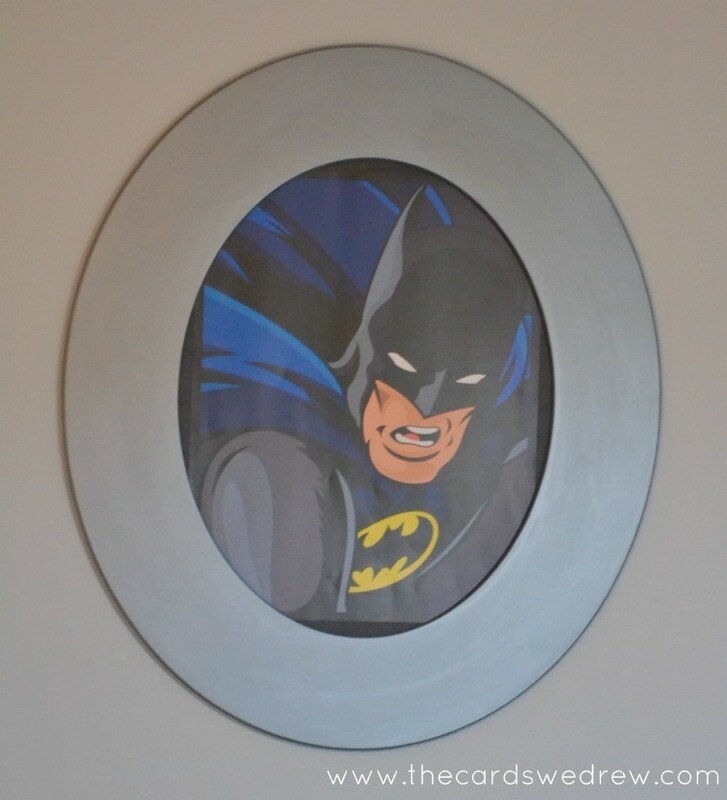 I then used the Oval Frame for the Batman print and painted it silver with Metallic Silver Paint from Modern Masters…their metallic paint is so great! I love how the whole wall turned out…it’s a nice little accent or ode to my son’s current tastes, but it can be easily changed out as his tastes change. The frames are so fun and unique and tie in all the colors of the Herringbone Accent Wall. Overall, my son loves his new room son much and we’re still working to add little accents here and there as we find them. I really think a good room is an ongoing work in progress that takes time and effort looking for the perfect little touches! The best part of all this is that I’m giving away a little mini prize package today to Cut It Out Frames and Modern Masters Paints! So you can get some of your own frames and metallic paint and create some great artwork for your own home! Up for grabs is a $25 gift card to Cut It Out Frames, which includes free shipping! Also…. You get your choice of One Quart and One 6 oz. container of your choice of colors of Modern Masters metallic paint OR four 6 oz. containers of metallic paint in your choice of colors! Fun, right???? Giveaway will begin December 30th and end on January 6th at midnight. To enter use Rafflecopter widget below and see terms and conditions for additional information. 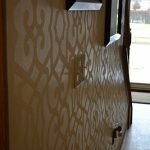 High Gloss Stenciled Wall and a Royal Design Studio Giveaway! I would choose the Matte Metallic Paint. Although the red would look great on my front door! So hard to choose! I would choose the Balboa cut it out frame. Hard to pick they are all so beautiful…. I would get two 8×10 Parker frames. Love them! I would choose snowflake, pewter, nickel and blackened bronze for the metallic paint. Looks great and thanks for the giveaway! I would choose either the Copper or Copper Penny colors. Beautiful colors! 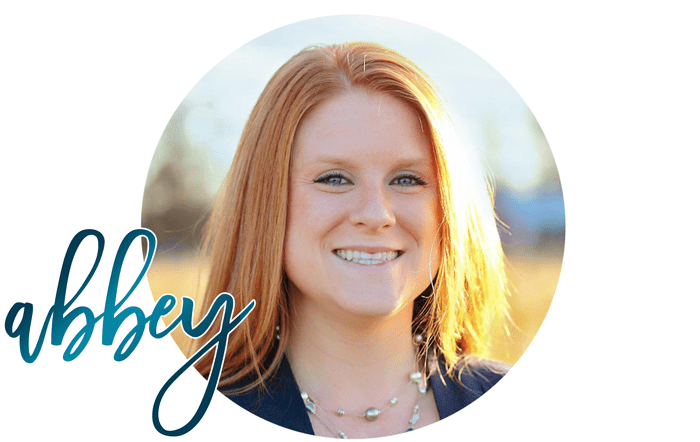 I would choose the Grafton & the Balboa 4″x 6″ double layer frames…..love them! Definitely a front door color. I love all the cutouts. I live this. My mom has gotten several large stickers for my son’s walls and I just hate to stick stickers on the walls. 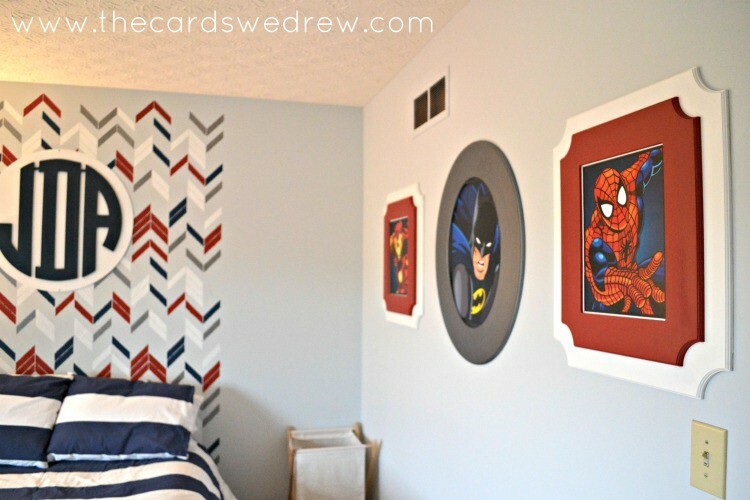 What a great idea to tastefully display superheroes! And there is room for growth! I love this, such a creative way to display the not so beautiful super heroes that our kids all love! I would use the 8×10 Parker double frames and choose the pewter and nickel for contrasting colors for my son’s batman stickers that he has already! Kudos to you! Love that you could even change them out as he grows out of super heroes! Love cut it out frames! I would pick the pewter-perfect shade! 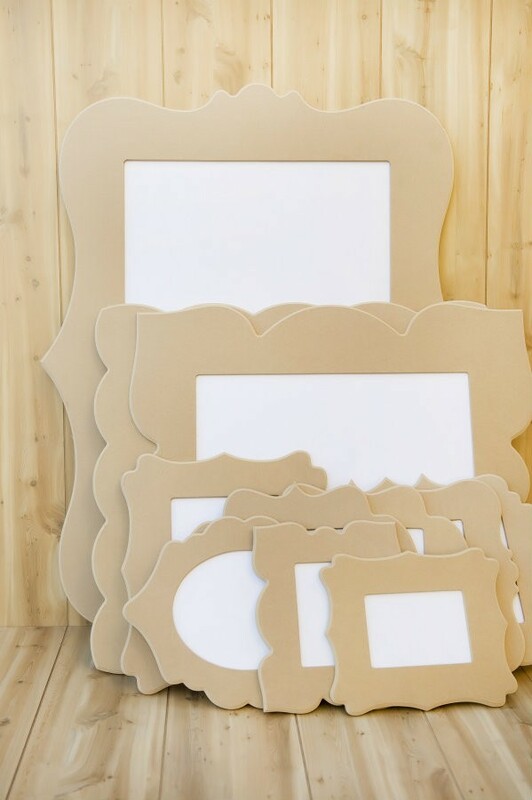 I love cut it out frames they are amazing! I need some pink paint. I love painting new crafts! I like the Balboa cutout. I would love to get the Platinum! I love the Parker double layer frame! I would have to choose the 6oz bottles because I can’t pick just one color. I would probably choose the pewter, smoke, champagne, copper and teal. I would choose black cherry! As crazy as this may sound, I am loving the Candy Apple Green metallic pain color. 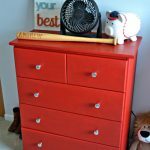 I’m getting ready to move my craft room to a new room so my oldest daughter can have her own room and I’m thinking that Candy Apple would really brighten my new space! Fabulous colors all around, it was hard to choose!! I would select a handful of the Newport Single layers so I could frame photos of my four little ones! I really love anything Green Apple, so Green Apple ME706 would be my pick. 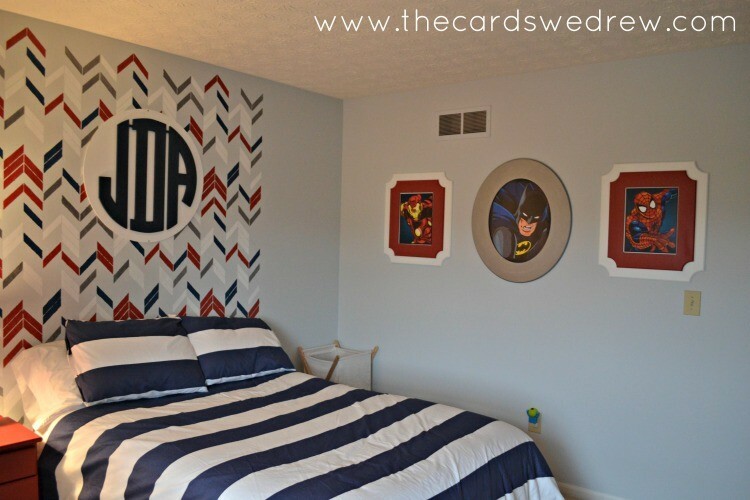 I would love to do something like this for my grandson’s room. Love it! My favorite frame shapes are Balboa, Newport and Chandler. The double layers look awesome. The black pearl metallic paint really stands out to me! All of the frames are great, but I think I like the Parker style the best. I like the pewter matte paint color and the round double layer frame. Three choices- Platinum, Oyster, and Pewter! Hard decision!!! Loving the Newport Double Layer frame! So hard to pick the paint colors b/c there are so many! I like the silver, sapphire, Venetian blue, green apple…to name a few. Our son has a transportation themed room with blues and greens so probably colors to go along with that with some sashay red as accents I think. Again…so hard to pick but my favorite would be Chandler and I also like Newport too. I like Parker too. I would get the antique copper paint. I love the round frame and Pewter paint!! Awesome! Always liked the Balboa…any size Single or Double.. I love the antique bronze and the red door! What a great giveaway! I am excited to check out the frames anyway! I would choose pewter. Awesome giveaway! I would choose the Black Cherry metallic paint. I would choose some Balboa style frames. I like the chandler frames. Your son’s room turned out so cute! I am in the middle of refinishing my son’s room and would love to use the frames for his room! Your son’s room turned out so cute! I am in the middle of refinishing my son’s room and would love to use the frames for his room! I would choose the Balboa frame! Love the matte metallic paint! Love Cut it Out frames! Any Cut it Out frame with gold metalic paint is a great combination. I love all of their frames, so if I won I would have to really sit and think which to buy. We just had family pictures taken so I need a frame for that. It would definately be a double frame though. I think I would choose the Black Pearl paint. Most of the frames in our house are black and I think I would continue with that. However, I may decide to get some sapphire and do something to contrast everything else. I really like that color. I love the English Brown and Snowflake. These paints are great! I think my favorite frame is Chandler but they are all so sweet! Love Love Love pewter!!! And all of the cut it out frames are amazing!!! I would go with red metallic paint, that would look so fantastic! I already have the Chandler frame in 16×20 and I love it! For my next frame I’d love to get Preston, or maybe Balboa or Brooklyn! I would pick sashay red!